We know King Solomon valued wisdom, and in his many Proverbs he encourages people to seek out wise advice and to learn from those who have already acquired knowledge. 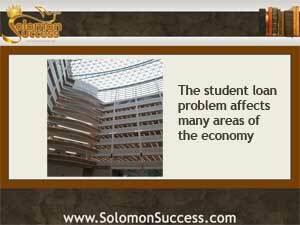 That advice remains as important as it was in Solomon’s day – but for many students today, the cost of going to collge can create a burden that affects all other areas of the economy. It’s oo secret that student loan debt is still out of control. But some financial experts are suggesting that the problem lies with the student loan system itself. We’ve reported in this space before about the spiraling student loan crisis and its resemblance in some ways to the irresponsible lending that led to he housing collapse of a few years ago. And we’ve continued to talk about it from time to time because the debt problem isn’t just a problem for college students and new grads. The debt load carried by a majority of students after a standard four year college education affects their credit, their earning power and their ability to participate in this consumer economy –which includes making major purchases such as houses. Now, some analyses say, recent bickering in the House and Senate over the failure to pass a bill that would continue to hold interest rates on student loans at low levels reflects a continuing failure to recognize the real source of the problems. It’s not, they say, that students need more help to manage student loans – it’s that the student loan system itself is the problem, along with the rise in for-profit colleges that set students up for failure. Along with that, student loan debt has none of the safety nets other kinds of loans, such as mortgages might have. Students don’t have the option to refinance their loans. They’re nearly impossible to discharge, and are exempt from bankruptcy protections –main realigns why the default rate is so high.